By now, you’ve probably heard of Sage Intelligence. But lately, you may also be hearing about a newer Sage “Enterprise” Intelligence option. While both products provide business intelligence (BI) reporting tools that work hand-in-hand with Sage 300, each differs a bit in the functionality they provide. In this article, we’ll explore those differences. Sage Intelligence pulls real-time financial and operational data from Sage 300 and delivers it in Excel templates which you can easily view and/or customize. The Excel-based interface lets you slice, dice, and analyze your Sage 300 data in graphs and pivot tables that provide a much more hands-on and visual experience than standard reports can provide. Similarly, Sage Enterprise Intelligence also provides a visual approach to reporting that allows non-technical users to perform advanced slice-and-dice analysis of Sage 300 data. While the product is owned by a third party and licensed to Sage customers through an OEM agreement, first level support is still provided by Sage with higher level support handled directly by the developer. It’s also worth noting that depending on your Sage business care plan and the version of Sage 300 you’re running, Sage Intelligence may already be installed on your system and ready to use. In fact, user licenses for Sage Intelligence may already be included in your plan which potentially makes pricing a differentiator between the products. The short answer is neither one. The reason that Sage offers two different BI solutions is to provide a variety of analytics and reporting options to customers across a wide variety of industries and needs. 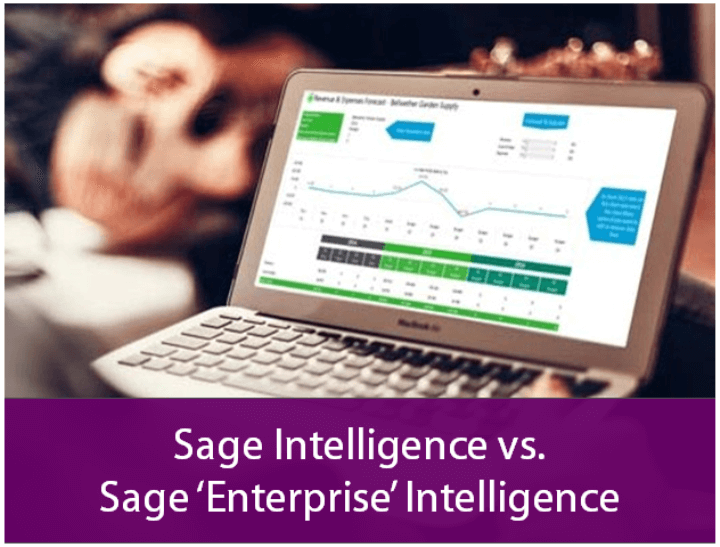 It shouldn’t be assumed that Sage “Enterprise” Intelligence is better than Sage Intelligence because it’s not. They simply offer a different interface and set of features to accomplish a similar objective - better business insight through more flexible and intelligence reporting. Click below to get in touch or request a copy of the feature-to-feature comparison guide. Our business intelligence experts can answer all your questions and help you choose the right reporting tool for your company.